With Avira Phantom VPN you can browse and download from the Internet completely anonymously. 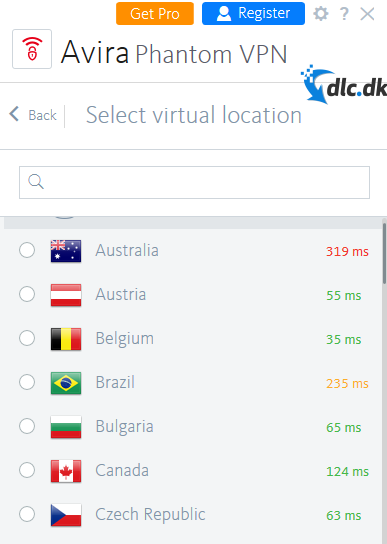 This VPN service is lightning fast and has an easy-to-navigate interface. 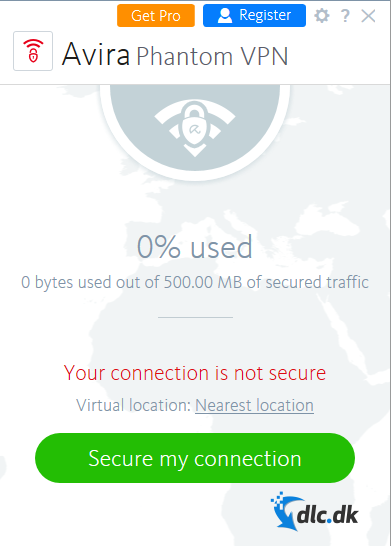 However, this VPN service is far from the only one on the market. In fact, VPN services in recent years have become incredibly popular, and this has resulted in both well-developed and disappointing software. Avira Phantom VPN differs from existing one, as this VPN service has Avira's well-known quality and functionality. VPN is an abbreviation of Virtual Private Network and is a kind of intermediary between your local IP address and the VPN service's server (also called proxy server). 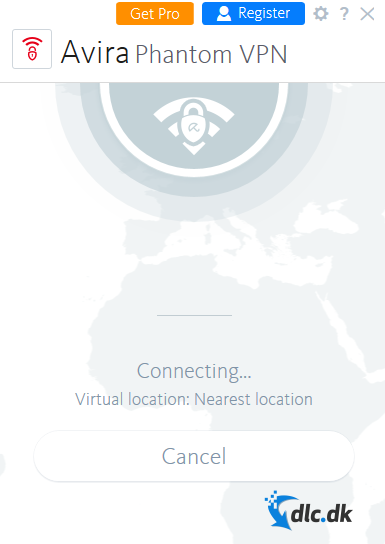 This VPN server has a kind of "false" geographical location that can be anywhere in the world. For example, if you is associated with a proxy server in America, so you can through your VPN service among other things. access to the US Netflix content. Over the past few years, more and more people have become aware of how much data we leave behind when surfing the internet. Even if you use credible and reputable websites, you still leave traces. In addition, there have been a number of scandals including the Facebook scandal, where many users found that their private data had been abused. For this reason, many have started to use various VPN services. The growing interest in online privacy has of course meant that a lot of software has been developed for the purpose. VPN services are far from new, and have existed for many decades, but the target group has changed from IT geeks to general computer users. This is only an advantage for us users, as the competition market has made us have excellent software developed. Avira Phantom VPN is immediately a good bid as it is obvious to supplement with if you already have Avira Internet Security. As the users of VPN services are more general users, it is also necessary for VPN services to be found by the general users. Avira Phantom VPN is incredibly easy to navigate around, and many quickly get to know the program. As seen above, it is limited how much you can mess around in the program. The most basic functions are there, such as attaching to specific proxy servers. However, it is also a huge plus that there are so many proxy servers to choose from. Once you are affiliated with a proxy server, you hardly find it. Otherwise, one of the disadvantages of a VPN service is usually that one's internet connection may be significantly slower when associated with proxy servers. Previously, it was almost impossible to make the most simple search, as the connection to the proxy servers was so poor. This was primarily a problem with the free version of VPN services. The only difference from Avira Phantom VPN free version and purchase version is the availability of user support. This means that you can enjoy the full functionality of the program without costing a single penny. If Avira Phantom VPN has not caught your interest, we fortunately have some other good VPN services available. 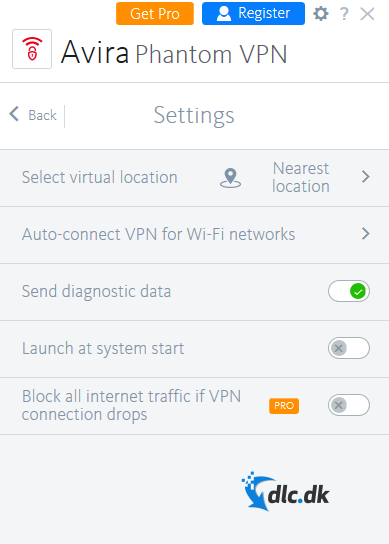 NordVPN is one of the most popular VPN services at present, and that is for good reason. This software is outrageously easy to use, and their proxy servers are impressively fast. NordVPN has received a warm recommendation from us, and our users are also very satisfied with the tool. FastestVPN has recently been developed and distinguishes the other VPN services by offering a number of additional features including adblocker that blocks advertising from websites. If none of the above VPN services have caught your interest, then you can with advantageCheck out our VPN category out here . If you are looking for a VPN service that offers a simple and straightforward interface, then Avira Phantom VPN is an excellent bid. The software is well developed and virtually anyone should be able to find out how to use it. Well known then the manufacturer Avira also develops security programs that are also very well-functioning. So if you already have an Avira product, then it is recommended to use their VPN service as these programs complement each other to perfection. Avira Phantom VPN is designed for Windows, Linux and Mac, so no matter which operating system you can join. It is also possible to download the application for iPhone and Android, and you can do this by visiting the phones application store. Find Avira Phantom VPN, mark it and choose "Uninstall"
Should Avira Phantom VPN has been damaged or corrupted and thereby difficult to remove we can recommend you finding help to uninstall it here.